It’s important to remain fit and active, no matter how old you are or how busy your schedule is. Bettering your health naturally through regular exercise and a proper diet can dramatically improve your focus, drive, fitness and energy levels, confidence and much more. The bottom line is, you need to take the time out to stay fit – the quality of your life can greatly depend on it. “I played a lot of sport as a youth and excelled in Rugby League as a junior and in to my adult playing years. Unfortunately my much anticipated career as a Rugby League professional came to a crushing closure on a Friday night playing an Under 18’s match when I ruptured my Anterior Cruciate Ligament. “… I did not cope very well with not being able to pursue my sporting dream and needed to think about what my future held and what was to be my profession. Unfortunately alcohol consumed much of the 80’s and 90’s masking a self pitying attitude and deep seeded resentment towards life in general. “… I was not unhealthy, just overweight and not spending enough time maintaining a balanced lifestyle. I have always been acutely aware of the parts of the body that start to wear as middle age approaches and it was with some degree of shock that I was diagnosed with an aggressive form of cancer of the prostate in August of 2013. “My Urologist scheduled surgery for September of 2013. The 2 major side affects of having a radical prostatectomy are urinary incontinence and erectile dysfunction. One of the ways to minimise incontinence is to strengthen your pelvic floor muscles so that you have greater control. My Urologist sent me to a physiotherapist and also suggested that shedding some kilos prior to my surgery would be of some benefit. 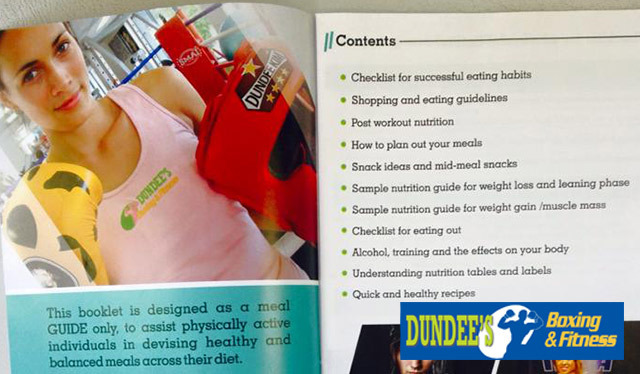 “…So began my journey with Dundee’s Boxing and Fitness. I regularly passed the Gym on the way to work in the morning, however never really giving a thought to entering. “… I dropped 10 kilos prior to my surgery. Dundee’s and particularly Dasa provided a release for me prior to surgery that distracted me from thinking about what my prognosis would be and whether I could become a cancer survivor. “I am pleased to say that my surgery was a great success!! Not one of the more pleasant experiences of my life, however the pelvic floor muscle strengthening provided a platform to surge towards good health. I amazed nurses and my Urologist on the removal of my catheter post surgery that I suffered from no incontinence. This is solely attributed towards the time and the amount of pelvic floor muscle exercises that Dasa ensured that I did prior to my surgery. 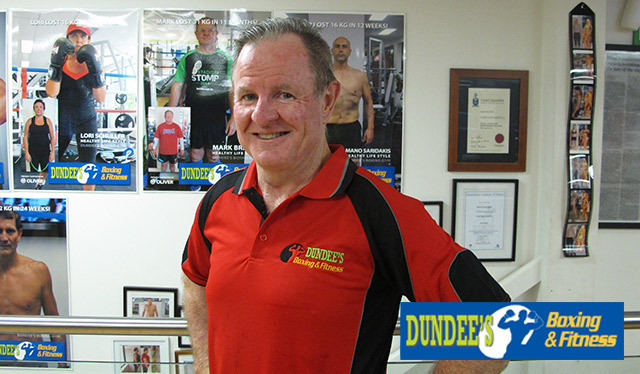 “… Training at Dundee’s has become a way of life for me. The level of support and encouragement provided by Dundee, Dasa and Sam have provided the inspiration to continue to train hard with specific goals. The exercise is a great release from my working life which is often shocking and stressful. “I now weigh in at between 82 and 84 kilos with a commitment never to exceed 85 kilos again!! Read the full version of Mark’s story. 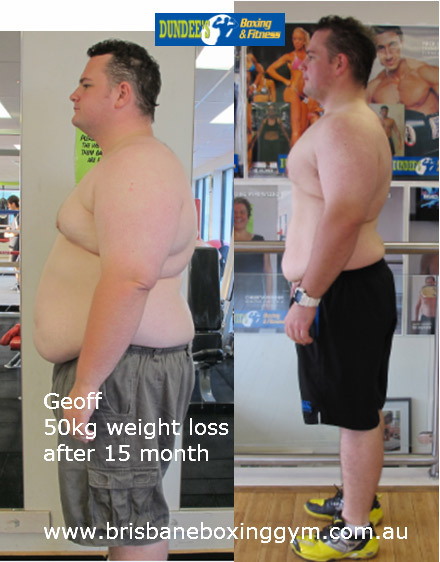 Before joining our gym, Geoffrey weighed over 165kg. He said that “General tasks were becoming more and more challenging and even simple things like getting out of the car, walking up a flight of stairs, and getting around in general would cause me to run out of breath.” He’s since lost over 50kg and treats the team as a family. He plans to turn the story into a book (read chapter one on our how to be healthy page). Read the full version of Geoffrey’s story. I am 55 yrs old and have a medical condition called lymphodeoma. I was very sceptical about going to a gym. During a flight to Melbourne I met Dundee who seemed a caring and professional person. In conversation one thing led to another and before you know it I had made a decision to visit Dundee’s gym. With the help of Dasa (a very caring dedicated and professional young man) I lost 15 kgs in 16 weeks and most importantly my cholesterol levels had crept up and I needed to start medication but now after my weight loss my cholesterol has dropped considerably and I no longer need medication. Also with my lyphodoema problem, I can now sit on the floor and play with my grandchildren, which I could not do before. Have no pain at the end of the day and my movements in my leg have improved immensely. And have lost a total of 10cm in leg measurements. Thanks to all the trainers at Dundee’s Boxing & fitness for all their support and making me feel so special. If your thinking of losing weight and getting fit. Don’t be, as everybody there is so friendly, caring, dedicated and professional. When 53-year-old Sue started training with us, she had high blood pressure, type 2 diabetes and spondylolysis (bone problems in the neck, knees and spine where she could hardly move). After six months, she lost 22kg and now has her blood pressure and diabetes under control. Her bone issues are no longer a tremendous problem – she now enjoys a more active lifestyle. Here’s a video of Jaimie, a fantastic client who lost 10kg after giving birth to her first child. She’s full of energy and is great at padwork! The first step you need to take to improve your life is to decide that from now on, you are going to work hard to make it happen. The next step you need to take is to find a coach or mentor who will continuously motivate you to push yourself. Contact us, fill in the form below or visit our gym in West End today for further advice from us on how you could improve your health. Your first consultation/session is on us! Fill in the form below, call us on 0488 500 134 or visit our gym today for a free session or to simply find out more.